The Duchess and a cuddly bear. What more could you ask for on a dull Tuesday. Kate Middleton spread cheer at London's Paddington Station as she joined her husband Prince William and brother-in-law Prince Harry to see off 130 youngsters on a vintage train journey through the English countryside. The day trip was sponsored by some of the charities the royals support. 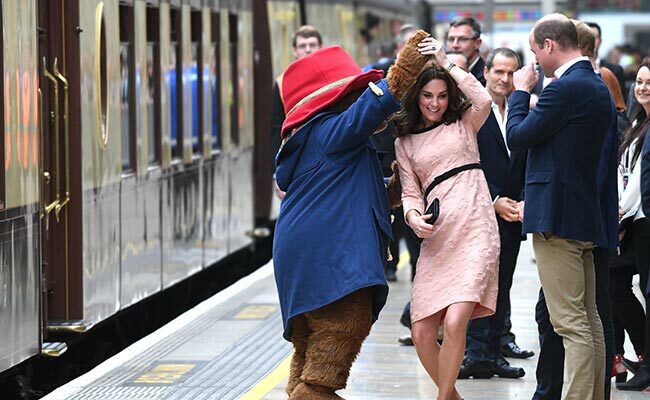 During the surprise visit, the Duchess indulged royal fans with an impromptu twirl with the fuzzy character at his namesake station. And Paddington seemed particularly impressed with her dancing skills. "She's a right good mover, and I think she could win Strictly Come Dancing - if she was in it," said the person dressed as the fictional character. The three interacted with the children, some of whom were survivors of the deadly Grenfell Tower fire. The royal photo-op came ahead of the release of Paddington 2 next month. The children also met some of the stars from the new movie. Here's your bonus video of them dancing. You're welcome!